A monthly Welsh language religious periodical, intended for Congregationalist Sunday schools. The periodical's main contents were articles on religion and the traditions and beliefs of foreign cultures, a section for girls and poetry. 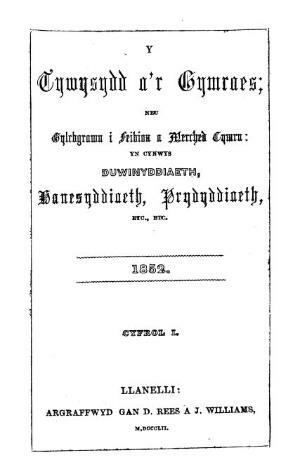 The periodical was edited by the minister, David Rees (1801-1869) and the minister and journalist, Evan Jones (Ieuan Gwynedd, 1820-1852) until March 1852, by David Rees until January 1866, and subsequently by Thomas Davies, Llanelli (1823-1898) and Thomas Davies, Llandeilo (1820-1873). Associated titles: Tywysydd yr Ieuainc (1837); Y Gymraes (1850); Tywysydd y Plant (1871).